With the rapid increase in hacking and data leaks, there's never been a stronger need for application developers to encrypt sensitive data stored in the cloud. However, without specialist knowledge in cryptography, it’s incredibly difficult for developers to develop secure applications that properly and securely implement encrypted data storage. products will work, but may be easily attacked. Make sure to have other review your designs and code. Don’t invent your own ciphers or modes. Insufficient design and analysis leads to security holes. Financially costly and time consuming to develop and maintain systems that properly implement cryptography. Libraries built into the user's OS may be old and contain vulnerabilities. Software updates can introduce bugs and new vulnerabilities. Libraries on different platforms (including mobiles) implement primitives differently, making consistency in security difficult. Using primitives that are no longer considered secure. Generally no notice is provided in the documentation of crypto libraries. Using primitives that are not future-proof, such as those vulnerable to attack by quantum computers. - Failing to securely derive encryption keys from passwords. - Encrypting too much data with a single key. - Encrypting data without using MACs on untrusted storage media. - Failing to salt hashes, seed random number generators, etc. Implementing encryption without proper consideration as to the requirements for confidentiality and integrity can lead to information leakage, security holes and exploits that compromise the effectiveness of the system. Due to the limited availability of experts, many crypto systems are implemented by developers who lack the required specialist crypto expertise, leading to vulnerabilities that are exceptionally difficult to detect and expensive to fix. Insufficient budget is given to cryptography. Encryption is most often a non-revenue generating requirement of a software project, not core functionality for customers. Thus, it is often allocated little budget, resulting in poor implementation that is easily attacked. Conversely, if cryptography were allocated the appropriate amount of budget for proper implementation, it would cost so much it would compromise the profitability of software development projects. Compile a modern, trusted and well reviewed crypto library into your application to ensure the same crypto library is used on all deployments. This is the approach taken in the development of ScramFS. Use modern primitives such as those chosen in ScramFS. Ensure only the primitives offering the highest security are used. Use only primitives that are resistant to attack from quantum computers. Using the right primitives in the wrong way will result in a system that is easily compromised. Design your encryption system using the right primitives in the right way, and with careful consideration as to the overall design. This requires world class expertise in the field. Ensure that cryptographic designs are peer reviewed by other world experts. These are the approaches taken in the development of ScramFS. Perform careful security analysis of the system design and attack model to ensure the design is resilient to all attacks in the chosen application. Peer review the design and security analysis. Find an existing reliable and complete cryptographic data storage system such as ScramFS to enable non-crypto developers to implement secure encrypted storage without writing crypto code. Avoid developing your own encryption and data security systems. Instead, license an existing system like ScramFS. Scram has already invested hundreds of thousands of dollars and years of time in developing solutions like ScramFS. Scram also provides ongoing support, maintenance and development of ScramFS, saving developers time and money now and in the future. 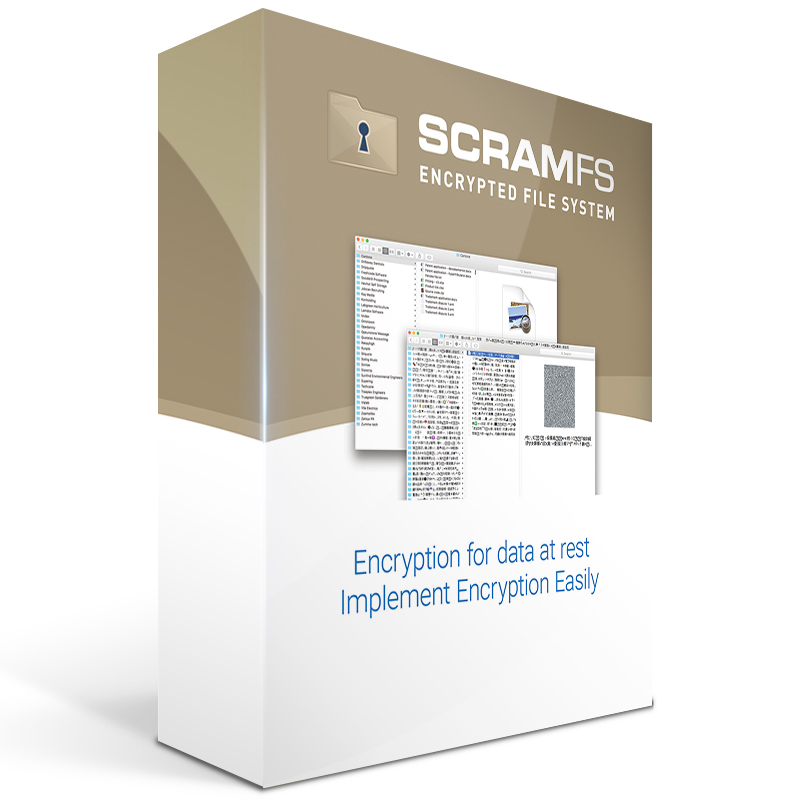 ScramFS is the world’s first cloud-friendly, cross-platform, high performance encrypted filesystem with a programmable API. The ScramFS API makes it easy for any developer to create applications that implement encrypted persistent data storage. It supports many back-end storage media, from cloud storage (WebDAV, OneDrive, Google Drive, and so on) to local storage (hard drive, USB drive, DVD/BluRay discs). 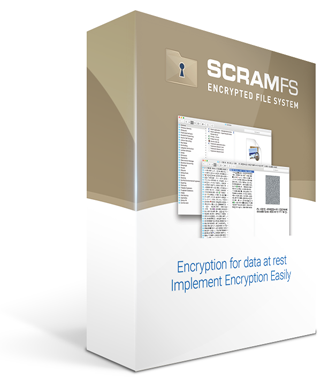 ScramFS also features a demo User Interface similar to Windows Explorer, which allows users to copy files to and from a mounted ScramFS. Introduction to Cryptography by Christof Paar — Professor Christof Paar's 24 lecture series on YouTube.